A push is under way to make it illegal for city stores to pack up your goods in those bags, CBS 2’s Mike Parker reports. 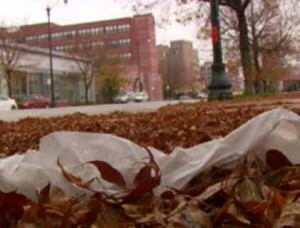 Chicagoans use and throw away an estimated 3 billion plastic bags each year. And they’re not hard to spot being carried by shoppers all over town. Unfortunately, they’re also easy to spot everywhere, after they’ve been used and tossed. There seems to be a bumper crop this fall. Moreno wants a new ordinance prohibiting big retailers from providing plastic bags to customers. Stores would be fined from $150 to $250 if they did not obey the law. The billions of bags used in Chicago are not merely eyesores, Moreno argues. To make them takes 12 million barrels of oil each year, and they’re difficult to recycle. Plus, they can clog up the sewer system. The Illinois Retail Merchants Association is promising to battle the proposed bag ban. “Certainly consumers are using them. They obviously want to continue to use them, so we continue to provide them,” spokeswoman Tanya Triche says. Moreno says if the outright ban doesn’t fly in the Council, he’ll go to Plan B: charging a tax of 10 cents on retailers for every plastic bag they buy. He figures that could bring millions of dollars in revenue to the city and put pressure on stores to stop using the bags. ​The Reusable Packaging Association (RPA) has created a Reusable Packaging Economic Calculator to help businesses determine the cost savings of switching from single-use corrugated packaging to reusable packaging, it was announced today by the RPA. The calculator is available at http://www.choosereusables.org. "Now more than ever, businesses are trying to reduce their operating expenses, and reusable transport packaging is a proven and effective way to reduce costs," said Bob Klimko, Chairman of the RPA Board and Director of General Industrial Marketing for ORBIS Corporation. The Reusable Packaging Economic Calculator is based on a financial model that covers the key concepts in the comparison of the per container cost of both reusable and single-use packaging. The tool allows a potential reusable packaging user to perform some basic financial analysis to determine if the supply chain in question is financially conducive to reusable packaging. The calculator was developed in cooperation with StopWaste.Org (www.stopwaste.org). The model compares basic cost differences of single-use corrugated packaging and reusable packaging. The calculator factors in corrugated costs, dwell time (how long containers are held at various stages of the supply chain), cartons shipped annually, annual interest rate, return miles for reusables, and the expected replacement rate. While the model uses factual inputs from prospective users, it is intended to offer guidance and not an absolute indication of exact cost benefits. More specific models are available to determine specific cost benefits, and additional assistance is available from RPA member companies. Incorporating reusable packaging into the supply chain also can help corporations meet their environmental and sustainability objectives. Reusable containers have been proven to reduce solid waste and greenhouse gas emissions, improve transportation efficiency, and reduce energy use. These claims were substantiated in a landmark study conducted by Franklin Associates in 2004, Life Cycle Inventory of Reusable Plastic Containers and Display Ready Corrugated Containers Used for Fresh Produce Applications.